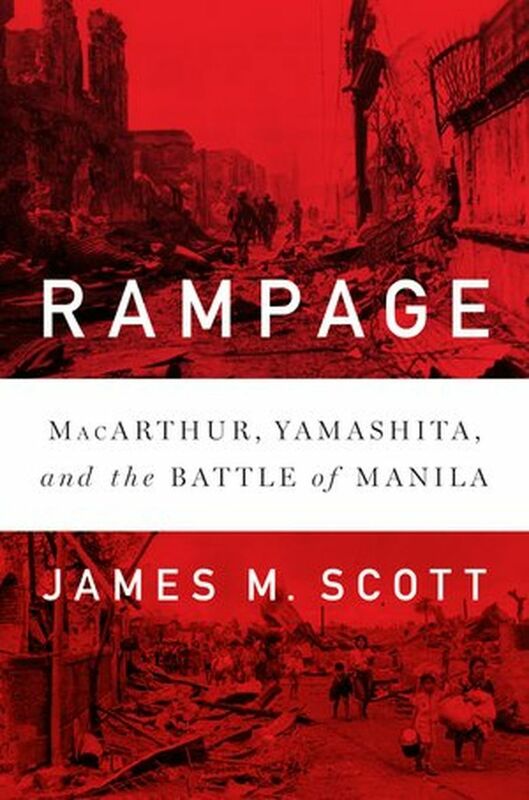 James Scott tells the story of Gen. Douglas MacArthur and the 29-day battle of Manila in his latest book, "Rampage," which unfolds in a chilling narrative of some of the fiercest urban fighting of WWII. In the years before World War II, Manila, under American rule, was known as the Pearl of the Orient, a city of swimming pools, golf courses and buildings nestled under thick green canopies of trees. MacArthur, after retiring from the U.S. Army, served as a military adviser in the Philippines. He, his wife Jean and their son Arthur lived in a penthouse suite at the Hotel Manila until they were forced to flee in April 1942 as Japanese forces took control of the city. MacArthur, who by then had been called back to active duty as commander of U.S. Army Forces in the Far East, famously vowed to return. In 1945 he did, and the 29-day battle of Manila that marked his grim homecoming is the story told by newspaper reporter-turned-military historian James M. Scott in his latest book, “Rampage,” which unfolds in a chilling, sometimes horrifying narrative of some of the fiercest urban fighting of World War II. By the time it was over, much of the city was destroyed and an estimated 100,000 civilians had died both from an organized slaughter by Japanese troops and through the artillery shellings and bombings of U.S. forces seeking to take control of the city. Scott, in the early chapters of the book, offers a compelling portrait of MacArthur, who prematurely declared the city retaken in an early manifestation of fake news, a move that frustrated war correspondents who struggled to get editors to pay attention to the unfolding battle that they thought was already won. He also profiles the Japanese Gen. Tomoyuki Yamashita, a reluctant warrior convinced that his country should stay out of the war launched by Germany but who — bound by duty — led the Japanese conquest of Singapore and later the defense of the Philippines as his nation faced the near-certain prospect of a crushing defeat. Much of the middle of the book focuses on the horrendous conduct by Japanese troops in the spring of 1945 as MacArthur led the U.S. Army campaign to take back the Philippines. Nearly 3,700 U.S. and European civilians were interned at a walled university compound called Santo Tomas. The Japanese cut down on rations and these men, women and children suffered from edema, bleeding gums, beriberi and other diseases linked to starvation. Some wrote down their favorite recipes — Boston-style fish chowder, clam pie and other delicacies — and circulated them, then pretended to devour imaginary meals that their bodies so craved. The book also includes firsthand accounts from Filipino survivors of a Japanese campaign to kill — often by bayonet and decapitation — civilians as U.S. troops closed in through fierce block-by-block fighting. During one mass execution of Filipino men, Ricardo Trinidad, a 23-year-old kitchen worker, was bayoneted multiple times, a blade passing through his back and popping out of his chest during a mass execution in a lumberyard. “I did not say anything or cry. I pretended to be dead,” he would later tell American war-crimes investigators. I found the hardest reading to be the graphic accounts of the slaughter of women and babies. Scott gives voices to the victims, and that is an important service to history. And it is all meticulously footnoted from sources that include archived eyewitness accounts in the Philippines and the U.S. as well as the author’s interviews with survivors. Fortunately, Scott — whose last book, “Target Tokyo,” was a finalist for the Pulitzer Prize for history — is a fine writer, and he musters his considerable talents to move the storyline forward, and keep “Rampage” from bogging down into a grim catalog of wartime atrocities. The book’s final section focuses on the war-crimes trial of Yamashita after he is taken into U.S. custody. Yamashita denied giving any orders to kill civilians, and the legal battle over Yamashita’s fate is waged all the way to the U.S. Supreme Court. In the end, he was hanged, denied a request for what was considered to be the more dignified fate of a firing squad. The ferocity with which Japanese troops fought in Manila offered U.S. military planners a bitter foreshadowing of what might lie ahead should there be a U.S. ground invasion of Japan. Within days after Manila was secured, the U.S. would launch aerial attacks on Tokyo that would take their own fearsome civilian toll, killing an estimate 100,000 people and leaving around 1 million homeless. These U.S. bombing raids on Tokyo will be the subject of Scott’s next book as the Charleston, South Carolina-based writer continues an epic exploration of the Pacific theater of World War II.